Highly aromatic, this one! Lovely rose and sandalwood combination. Rich. Enticing and exotic. 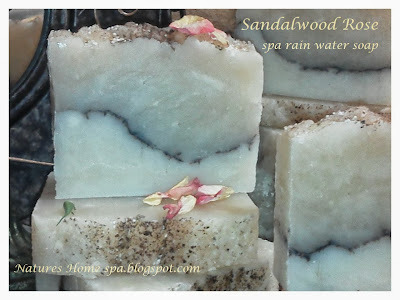 Sandalwood is the rich and aromatic wood from the Santalum tree, highly cultivated. The Indian and the Australian are the two most noted varieties in this genus. The interesting thing about Sandalwood is that it will keep its fragrance for decades, literally. That is unusual in a fragrant wood. It is a beautifully fine grained, yellow wood. It's East Indian wood source is becoming scarce making it very pricey. In this recipe I used a fragrance oil blend that was infused with natural essential oils of Cedarwood, Patchoulli and sustainably harvested Sandalwood. Woodsy, musky and softened with the rose fragrance oil made a lovely rich exotic bar. Very aromatic. The "pencil line" you see is a dark cocoa. The almost indiscernible white creamy line is finely ground Jasmine rice. Soft and silky, not grainy. 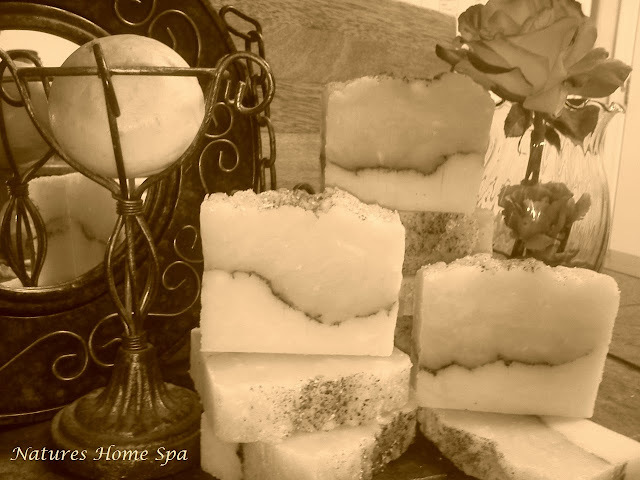 Just a lovely Spa bar made with fresh Arizona rain and enriched with unrefined Shea butter for that additional luxury! You can find this bar in my etsy shop. What a luxurious soap and scent :) I just love sandalwood and patchouli, and I can imagine how it is combined with rose. Thanks Kirppu, I really love this bar, been thinking of how to make it for a while now. Love how the scent came out. Very aromatic.